We have, over the past six months, in association with the Royal Institute of Architects in Ireland, conducted a Design Review Process for the regeneration of the public realm and built environment around Phibsborough Shopping Centre. ​You are invited to Phase III of the Design Review which is a Public Meeting and Exhibition of the ideas and designs produced by an expert panel of architects, urban designers, landscape architects, planners and transport experts in consultation with representatives from local community groups. The meeting will be addressed by Michelle Fagan, Chair of the Design Review Process and a number of the members of the Expert Panel and will provide an opportunity for questions, feedback and discussion. The continuing decline of Phibsborough affects the lives of all who live and work here. The recent sale of the shopping centre and its future development and the purchase of Dalymount Park by Dublin City Council and its development as a municipal space, now offer an opportunity to reverse this decline and to contribute hugely to the creation of a people-centred village that addresses the many needs of all who live and work here. 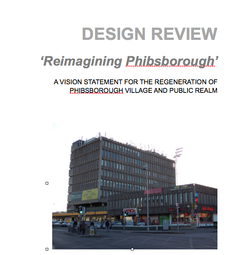 The Design Review Public Meeting and Exhibition is your opportunity to become involved in the ongoing work of the Reimagining Phibsborough campaign and the future development of Phibsborough Village. Phizzfest’s Reimagining Phibsborough Campaign has announced the launch of an Architectural Design Review for the local village. The review will be run in association with the Royal Institute of the Architects of Ireland (RIAI), which has previously carried out similar successful review processes in Kilkenny and Castlebar. This process has now completed and you are invited to Phase III of the Design Review which is a Public Meeting and Exhibition of the ideas and designs produced by an expert panel of architects, urban designers, landscape architects, planners and transport experts in consultation with representatives from local community groups.